FAQ – Can Pilates give me 6 pack abs? A – No one exercise program can result in 6 pack abs. Pilates concentrates on the “core” muscles so, if you do it REGULARLY (at least 2 times per week), your abs will become much stronger. That said, to actually see the 6 pack the workouts must include cardio coupled with diet. You can’t see those strong abdominal muscles if they are hidden underneath excess pounds. FAQ – I’ve heard Pilates can make you taller. True? A – Pilates can’t actually make you taller. However, the Pilates system works to strengthen, stretch and stabilize the body and in so doing improves overall posture to a remarkable degree. Do you slouch at your computer or when driving? By learning to focus on how your body is functioning, you become much more aware of how you are standing, sitting and carrying yourself during your everyday activities. Body awareness is one of the key components of a Pilates practice. In addition, stronger core muscles (coupled with body awareness) help to support the spine and improve posture. FAQ – What is classical Pilates? A – Classical Pilates is a system of exercises developed by Joseph Pilates. The exercises are usually done in a specific order, a specific range of repetitions per exercise, specific spring settings, and are done with a “flow” from one exercise to the next. Modifications and variations of a particular exercise can be inserted into the workout, but the workout will generally follow the format originally created by Joseph Pilates. The “classical flow system” of a formatted routine applies mostly to exercises on the mat or reformer, but there are classical exercises for the Cadillac, tower and chair as well. You may have also seen or heard of “contemporary Pilates” which can include classical exercises combined with other exercises. This form can still use the Pilates apparatus but is not strictly controlled by the classical exercise sequence and flow format. Contemporary leans more toward the gym type workout more people are used to doing. Since the name “Pilates” could not be trademarked, anyone can use the term in the workouts they offer. Certifications vary wildly in terms of what they include, the length of time required to complete the course work, and whether or not an apprenticeship period is required. Generally speaking, to get a feeling of the genuine Pilates experience, the teacher should have been classically trained. FAQ – Are my “core” and “abs” the same thing? f) multifidus (The multifidus is a series of small muscle fibers which travel up the length of the spine. It has a unique design that lends stability to the spine and keeps you upright). FAQ – How does a strong core benefit me? A – Think of your body as a tree. Without a strong trunk the branches and roots are meaningless. A strong core helps to support your body and allows you to move more effectively your the daily activities. FAQ – How often do I need to do Pilates? A – Think of Pilates as a practice. Just like playing a piano, the more you practice the better you become! Your core gets stronger as muscles get strengthened and stretched. Twice a week is recommended for you to begin to feel a difference in your body. Pilates is about the mind-body connection and to be performed correctly the exercises should be done in a mindful way. As you become more familiar with the exercises, you think less about the exercise itself and turn the focus on what your body is actually doing and how you can better perfect your form and work to a deeper level. In addition, you want to work toward building up “muscle memory” of what is required to perform the exercises. Yes, your muscles do have a type of memory! Pilates is often referred to as a lifestyle – commitment and consistency are key. FAQ – Is mat work only sufficient? A – Mat work only can be an excellent choice when done on a regular schedule. Exercises on the mat are actually some of the most demanding, especially when performed at the advanced and super advanced levels. Of course, not everyone can or should work out at the advanced level, which is why modifications are available for most exercises. Your body has to work against gravity and use only its strength, stabilization and body awareness to properly complete each exercise. Pilates apparatus uses spring resistance to assist you in performing and perfecting the exercises. 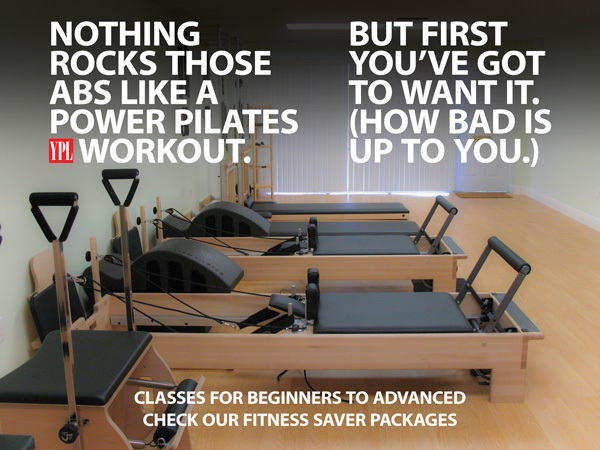 The ideal is to incorporate all of the Pilates disciplines – mat, reformer, chair, barrel and Cadillac/tower. Privates are best because the sessions are individually tailored to meet specific needs. That said, everyone has to take into consideration his or her own schedule and budget. Whatever method you choose, the level of success/results you experience depends directly on your commitment of time, energy and concentration devoted to your practice. FAQ – Are mat classes right for me? A – There are several different levels – beginner, intermediate, advanced and super advanced. Classes can include students at all different skill levels especially when trying to accommodate everyone’s busy schedules. If an exercise can’t be modified or it’s not appropriate for you, you can leave it out and rejoin the group on the next exercise. It’s important when attending an open/multi-level mat class that you “put your blinders on.” Don’t compare yourself to the person next to you – just do what you can do today to the best of your ability! FAQ – What should I wear? A – The best choice is clothing that is comfortable and allows for freedom of movement. Very loose clothing is not recommended because it doesn’t allow the instructor to observe body positioning during exercise. Also, Pilates exercises are generally done barefoot so footwear that slips on and off easily is a plus. FAQ – What if I have osteoporosis? If you have been diagnosed with osteoporosis, you should consult your physician to determine if Pilates is appropriate before joining a class. The National Osteoporosis Foundation recommends weight-bearing exercises to build stronger, denser bones. Bone is living tissue and it gets stronger when worked against gravity using the weight of the body itself and/or resistance training with weights, springs or flex bands. Pilates incorporates all of these forms of exercise. It also aides in balance and flexibility, helping to prevent falls. At YPL, I have a number of students who are experiencing osteoporosis and are discovering varying levels of relief.